This 1988 FJ62 was commissioned by a client in Miami who wanted a classic SUV to take on quick spins around town. Restored and customized for daily adventures, this FJ62 is ready to redefine what an SUV could be, all over again. 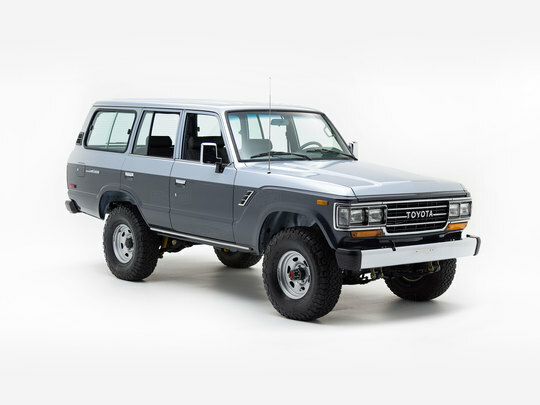 1988 is one of the most desirable model years for the FJ62. Not only are these some of the best-looking 60 series Land Cruisers you'll find, they're also the most powerful. 1988 marked the debut of the two-tone paint job, the double headlights with chrome trim, the front side marker lights, and, of course, the more powerful and economical fuel-injected 3F-E engine. The FJ62 was upgraded to make you feel like you own the road — and by “the road” we mean “any road.” We began with the 3F-E engine, which was completely rebuilt using OEM parts from the U.S. and Japan. This fuel-injected powerhouse is mated to a 4-speed automatic transmission, rebuilt by marque experts in Australia. Like all of our other builds, this FJ62 is equipped with an upgraded suspension system from Old Man Emu and all four-wheel drive components were restored to rock-crawling perfection. While our idea of luxury certainly has changed over the last 30 years, somehow this FJ62 still gets it right. The sweeping lines of the dash feel familiar and timeless, while 80's style controls mingle with modern-day conveniences, like the iPhone- and Bluetooth-ready premium sound system with its five-channel amplifier and eight-inch subwoofer. The floor received a protective coat of Raptor liner and all floor mats and vinyl upholstery are water resistant and washable — the perfect solution for our client, who likes to bring his dogs along for the ride. Interested in creating your own version of Toyota's first luxury SUV? Give us a call and we’ll work with you to build your dream ride.